One of our clients, a financial services company, asked us to help improve the company’s performance. Meeting with the management team, I was struck by the fact that one senior manager tended to foist the blame on others for the mediocre performance of his bond-trading division. When he did shoulder the blame, he did so halfheartedly, saying things like: “If I had more people, we’d be able to hit our targets,” conveniently forgetting his role in setting those targets. How do you avoid leadership “blindness”? How do you make sure you’re not confusing personal loyalty with professional competence? How do you get the right people on your team? And put them in the right roles? One tool is “behavior-based interviewing.” It’s predicated on the idea that past performance is the best predictor of future achievement. The first step is to identify the precise behaviors that are most important for success in a particular job. Managing a far-flung team, turning around a business, starting a new product line, building a sales team—these might be behaviors you’re looking for. Your detailed list of desired attributes becomes your litmus test—first for constructing a detailed profile of the job and then for interviewing your candidates. 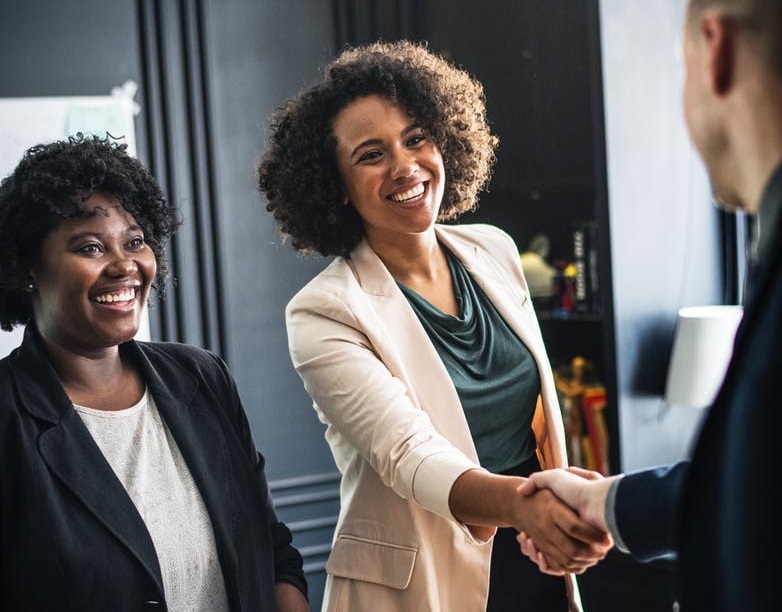 During the interview process, ask for specific examples of relevant experience: “Tell me an example of how you’ve successfully built a sales team.” “Tell me an example of how you’ve successfully turned around a floundering business.” If the candidate can share a relevant experience, then great! If not, you’ve learned two things: (1) he doesn’t have the necessary experience, and (2) he’s not very adept at thinking on his feet! 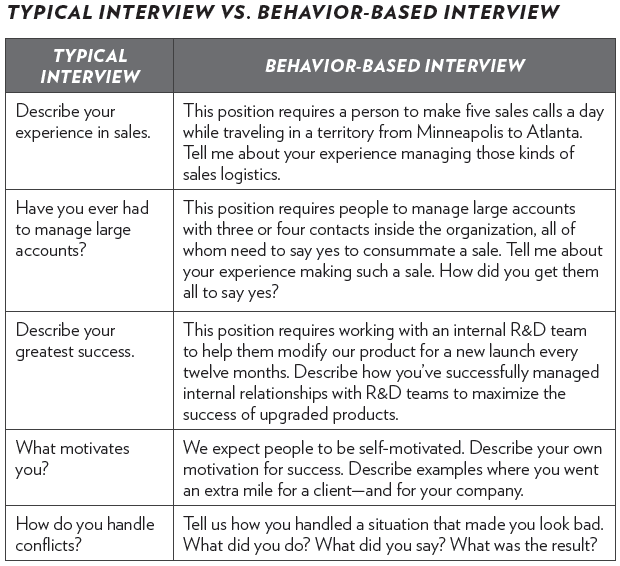 The corollary of behavior-based interviewing is open-ended recruiting: when a position comes open, you should keep searching until you find the right person, even if it means temporarily not filling the slot. Finding the right person is simply too important to warrant settling for less. The quest to get the right people means you should always be on the lookout for talent. After all, talented people are almost by definition not those who are pounding the pavement looking for work. So if you want to build a great company, you’re going to have to employ unusual means to get the right people on board. Good leaders typically spend 25 percent of their time recruiting and developing talent. Be disciplined about whom you hire, whom you promote, and whom you reward. It doesn’t matter how big or small your organization is; the cost of settling for second best can be huge. First, there’s the cost to ensure a new hire receives the proper training. That’s a cost you would bear in any case. But by settling for second best, you may have to spend more time training them to make sure they don’t make mistakes. Then, as you see that they require more supervision, you may spend more time checking their work. Maybe you insist on multiple sign-offs on their decisions. Maybe you revise a process to make sure their work is checked by someone every day. For the sake of filling the position, you’ve now added a little bit more bureaucracy to the organization. Now comes the higher, hidden cost. The talented people in your organization start to resent the new person. They’ve got to deal with his or her blunders. Maybe they have to subject themselves to the same bureaucracy. This irritates them at first—then it starts to grate. Morale suffers. Ultimately, the genuinely talented people decide to move on. The net result is a significant erosion of trust—all because you failed to find the right people in the first place.